Chopin's Polish Melodies, Op. 74 were not published during the composer's lifetime, and despite their high quality they have remained among his least popular works. All the songs in this collection were originally scored for soprano or tenor voice with piano accompaniment; some of them were later transcribed for piano solo by Franz Liszt. The first of these pieces is titled “Mädchens Wünsch”, which is usually translated as “The Maiden's Wish”. 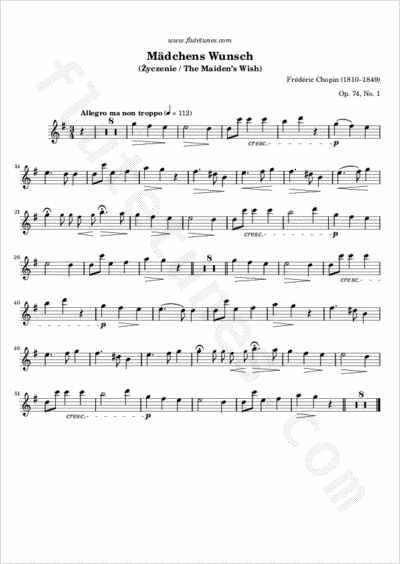 Written in 1829, it features a mazurka rhythm and an easily singable melody. The subject matter of the original song text deals with love, beauty and flirtation, and the music is lively and full of high spirits.